Explanations, sketches, and occasional obscure musings about human muscular and skeletal anatomy for the figure artist. Review Time: Combining Mind and Body! I think one of the loveliest things about being an artist is simply experiencing life as a member of the art community. As part of this creative and diverse demographic, I've met hundreds of different artists, each with his or her own unique characteristics, both artistically and personally. This year has been no exception, particularly after joining a few different social drawing groups and breathing new life into my personal drawing time. Creating illustrations for clients is one thing— it earns that all important thing known as A Living. But those drawings are for other people, and throughout 20 years or so of making art for other people, I had, to some extent, lost touch with the pleasure of drawing just to draw. As you can see, not only were we lucky enough to draw Kate in these poses, but we were also given the opportunity to shoot photos of her to use as drawing references later. The first thing I thought as Kate effortlessly arranged herself into one elegant posture after another was, "Yeah, I can see pretty much all her muscles and I really want to diagram them all RIGHT NOW." Doesn't everything think this? No? Oh well. I couldn't resist, so my next few posts will focus on this. 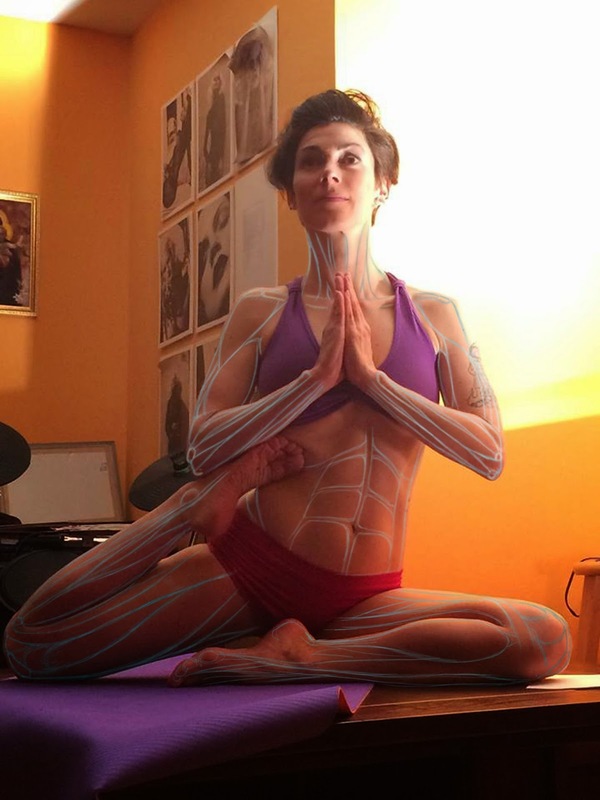 The wonderful thing about these poses, aside from their yoga-related benefits, is that each one beautifully highlights a specific area of the surface anatomy. Visualizing what's under the skin is a great help to drawing the body's surface appearance. Now let's look at the shapes on their own before we zoom in for a closer look. I've left out the head and face muscles and anything behind the clothing. But we can see anterior neck muscles, arm muscles, abdominal muscles and leg muscles from both medial and lateral views. The labels on the entire image show just how much can be identified. Structures will be identified by these numbers in the close-up views later in this post. So... let's zoom in to each area for a closer look. 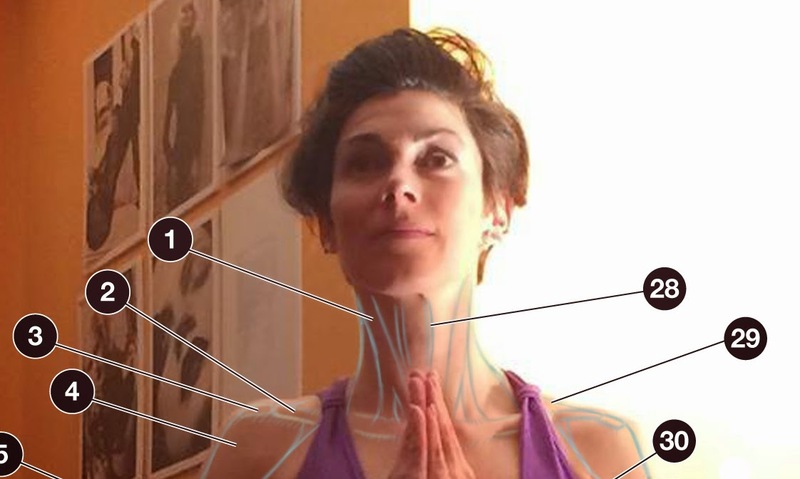 We can start with the anterior neck. These close-up images have the structures drawn in. Compare them to the photo up above with no muscles drawn in to see how clearly each shows on the surface. Some are barely visible while some make themselves quite apparent. 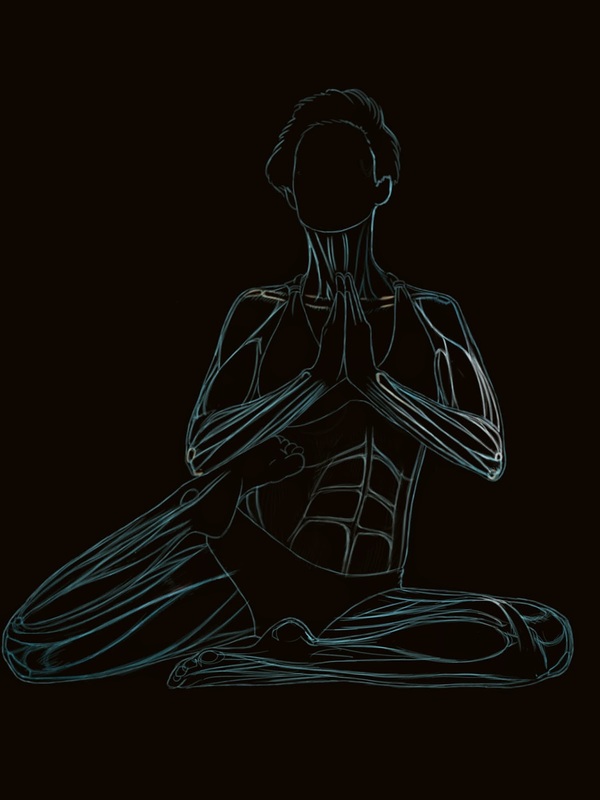 The clarity of each structure on the body's surface depends on many variables— the amount of body fat on the individual, the position of the body, and even the lighting in the room. There are three major anterior neck muscles that are commonly visible on the surface. One, the platysma muscle, can't be seen here because it usually only makes itself known when its owner is under strain. Kate pretty much didn't have to strain at all to make it into these poses, so the platysma is not making an appearance. We can, however, see other two prominent anterior neck muscles, the sternocleidomastoid muscle (1) and the sternohyoid muscle (28). Both muscles are named for their origins and insertions (sternocleidomastoid originates on the sternum (sterno-) and the clavicle (cleido-) and inserts on the mastoid process of the temporal bone (mastoid) tucked just behind the ear. The sternocleidomastoid muscles form sort of a V-shape on the anterior neck, while the thiner sternohyoid muscles between them run more parallel to one another down the center of the anterior neck. We can also see the clavicle itself (2) and the acromion process of the scapula, with which the clavicle articulates laterally. Most of the trapezius muscle stretches across the upper back, but one small portion of it can be seen from the anterior side of the shoulders, and a little bit of it is peeking out here (29). For more on the anterior neck, check out The Anterior Neck: Theme and Variations, and Sternocleidomastoid: Don't Forget the Cleido! Next let's take a look at the upper arm muscles. Kate's deltoid muscle (4) is defined nicely on both arms, as is the deltoid furrow-- the crease between the deltoid (4) and pectorals major muscles. You can also see the deltopectoral triangle-- an area at which the deltoid furrow broadens, which appears as a small inverted triangular depression just inferior to the clavicle. Moving distally from the shoulder, we can see Kate's biceps brachii muscles (6), and, peeking out from behind biceps, the brachialis muscle (7) and the lateral head of triceps brachii (5) peeking out behind that! On Kate's left arm, you can see the long head of her triceps brachii (32) and a TEENY TINY bit of her brachialis on that side (33). Did you notice all these muscle names have the Latin root "brach" in them? That's because this root means "upper arm." Nice, huh? Anatomical terminology is pretty logical. If you'd like, you can read more about that here. And for more on the upper arm muscles, check out The Deltoid Area: Soft Shoulder and Varied Terrain. Moving down into the forearm, things get a little crazy. The forearm is a beautiful, complex arrangement of multiple long, thin muscles, most of which twist gracefully down the arm and taper into long tendons that insert on the various wrist and hand bones. And yes, it's pretty crazy. But that's what makes it so awesome. On both of Kate's arms, we have a good view of most of the extensor/supinators, which lie primarily on the dorsal surface of the forearm, and most of which originate on the lateral epicondyle of the humerus (9), a bony bump on the lateral elbow. The three muscles in this group that we can see most clearly in this photo are the extensor carpi ulnaris muscle(37), the extensor digitorum muscle (36), the extensor digit mimimi muscle (8), and the anconeus muscle (38). On both forearms, you'll notice the extensor carpi ulnaris muscle (37) lies right up against the crest of the ulna (hence it's name!) 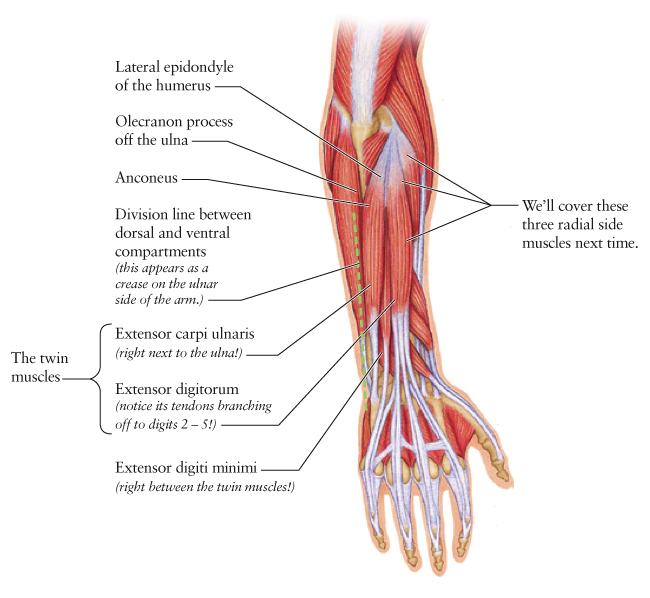 and, as we cross over the ulna, we enter the territory of the forearm flexors. These lie mostly on the ventral side of the forearms, which we can't see much of in this photo, but I was able to label two of them-- the flexor carpi ulnaris muscle (39) and the palmaris longus muscle (40) which I can't really see clearly here at all, but I know would be right behind flexor carpi ulnaris from this view… that is IF Kate has this muscle, seeing as it's missing in 12–15% of the human population! 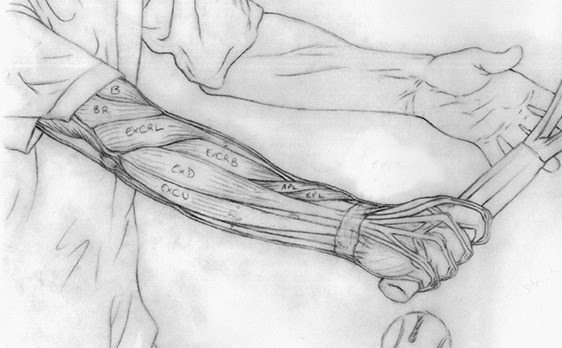 The Ventral Forearm: What Are Those Tendons? 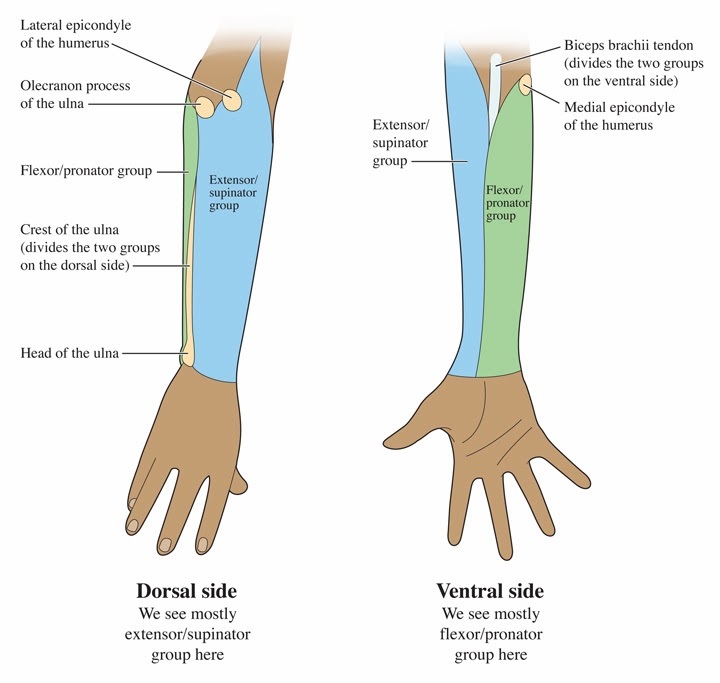 The Dorsal Forearm, Part 2: Which Side Are You On, Anyway? 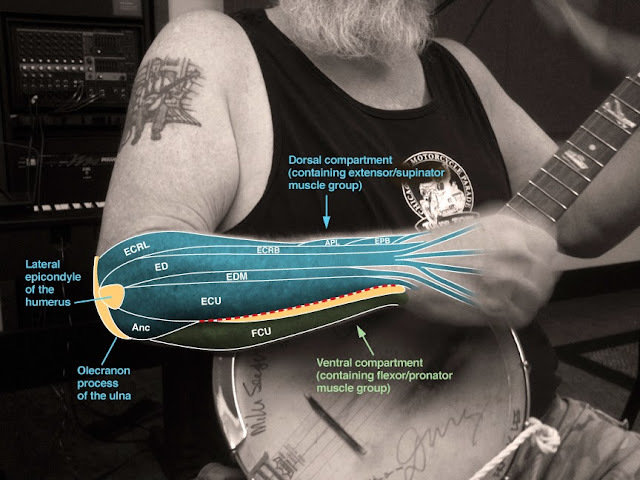 A Banjo Player's Forearm: Let's Get Lost! Now we can move down to the abdominal muscles, which are among the easiest to see here. The abdomen has several layers of muscle to compensate for its lack of bony protection, but only two abdominal muscles can be seen clearly on the body's surface. Down the center of the abdomen is the rectus abdominis muscle (42), a muscle known for its six-pack appearance. This segmentation is caused by the linea alba (43), a long midline tendon that bisects rectus abdomens bilaterally, and the interrupting tendons, which run horizontally and divide it up further. 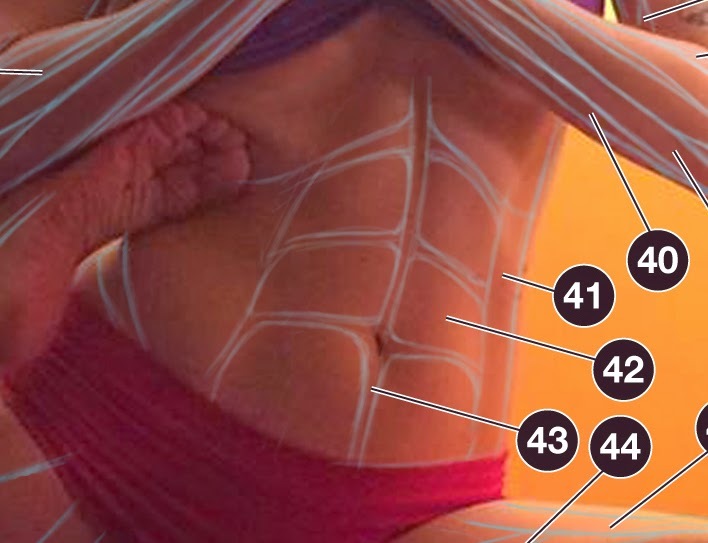 On either side of the rectus abdomens muscle, we can find the wide, flat external oblique muscles (41), named for their oblique fibers and for the fact that they each have counterpart oblique muscles (that are more internal, and as such are called internal obliques.) There's not much to see in external oblique other than the way it sort of bulges out over the iliac crest, which we can see slightly here. For more on the abdominal muscles, go to The Anterior Torso Muscles: Peel Away The Layers. So let's move on to the thighs! We have a good view of Kate's anterior and lateral right thigh muscles, starting with the tensor fasciae latae muscle (13), which inserts into the iliotibial band (15), a wide, flat tendon that travels down the lateral thigh. Just anterior to that, we can see most of the muscles of the anterior thigh muscle compartment, including the rectus femoris muscle (20) which is centered over the patella (18) and attaches to it via the quadriceps tendon (shown on the other leg with number 48). Other muscles of the anterior thigh compartment we can see are the vastus lateralis muscle (17) and the sartorius muscle (21), which is the longest muscle in the human body. Just distal to vastus lateralis, we may see or feel a bony lump, which would be the lateral epicondyle of the femur (19). On Kate's left thigh (to our right) we can see a few medial compartment thigh muscles, including the gracilis muscle (44). Also on her left leg, we can see the remaining anterior thigh compartment muscle, vastus medialis (46) and the medial epicondyle of the femur (47). We can see sartorius on this side as well (45). For more information on the anterior and medial thigh muscles, check out Batman's Anterior Thigh Compartment and The Lateral Knee: A Change of Scenery. Last, let's take a look at the lower legs. Same image as above, but we'll focus below the knee now. We have a good lateral view of Kate's right leg (to our left) and a good medial view on Kate's left leg (to our right.) Starting with her right leg, we can see both muscles in the lateral leg compartment, the peroneus longus muscle (16) and the peroneus brevis muscle (12). We can also see the lateral head of the gastrocnemius muscle, as well as the soleus muscle (14), which lies just deep to gastrocnemius and peeks out on either side. We can also see the tendons of both the peroneus longus and peroneus brevis muscles wrapping around the back of the lateral malleolus of the fibula (11). The interesting thing here is that, while both tendons run around the back of the malleolus, that of the peroneus longus show superficially when proximal to the malleolus, but that of the peroneus brevis shows superficially when distal to it! The sort of change places as they run past the malleolous. For more on this check out A Lateral Ankle Tendon: Peroneus Longus or Brevis? Finally, on Kate's left leg (to our right) we have a good view of the medial leg compartment. We can see the medial head of the gastrocnemius muscle (27) and just about the entire length of the tibia (25). The tibia is completely exposed on its medial side because no muscles obscure it here. The tibia's lateral side, on the other hand, is covered by the tibialis anterior muscle (26), which we can just barely see here. The tibialis anterior muscle is clearly visible on the anterior side of the leg, particularly when the foot is dorsiflexed (pointed up.) Its body, as mentioned above, covers the lateral side of the tibia, but as it extends distally and travels toward the foot, its tendon (24) crosses over to the medial side of the foot and inserts on the distal end of the first metatarsal. We can see that tendon running diagonally across the ankle, especially the foot is dorsiflexed and/or inverted (turned inward.) For more on the tibialis anterior muscle, go to Anterior Leg, Part 2: It's Lonely At The Top. There are a few more tendons we can just barely see on the dorsal surface of Kate's left foot. Just lateral to the tibialis anterior tendon (24) we can see the extensor hallucis longus tendon, leading directly to its insertion point on the dorsal side of the big toe. Just lateral to that, we can see a few extensor digitorum longus tendons (22) of which there are four; they lead to and insert on all the digits other than the big toe. For more information on the dorsal foot, check out How Do I Love Thee? Let Me Count Your Tendons. I just want to say thanks and HAPPY BIRTHDAY to Kate (yes, this post is going up on her birthday!) and invite you to also check out Kate's blog, Yoga Badassery, Kate and her friend Bleu Caldwell's podcast Pages, and also the wonderful yoga studio, Bikram Yoga Andersonville, to which Kate has introduced me and many others is the recent past. We love you, Kate! I hope you enjoyed this review of the entire body. Until next time! 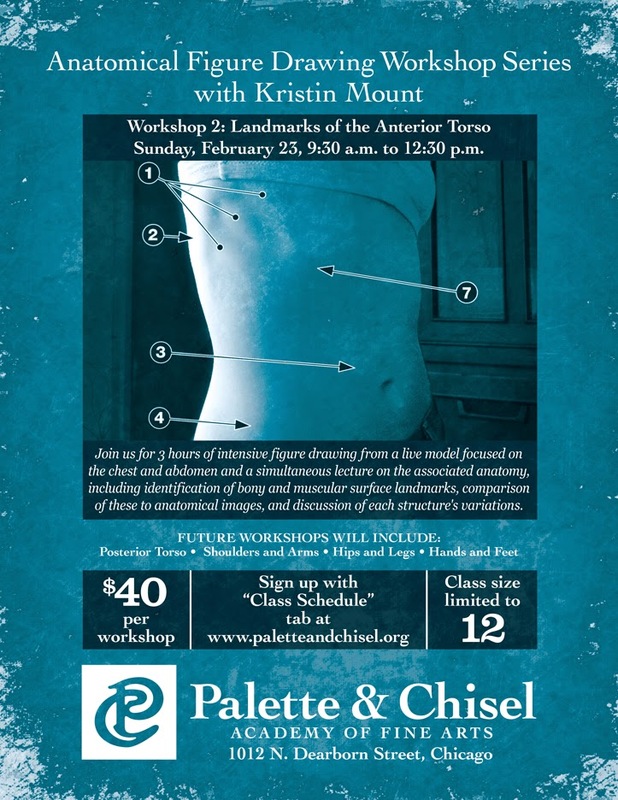 The next Anatomical Figure Drawing workshop at the Palette & Chisel Academy of Fine Arts has been scheduled! This workshop will focus on the anatomy of the hips and legs, which includes bony landmarks of the pelvis, femur, tibia, and fibula and the beautiful and complex muscle groups of the hips and legs. This workshop will be held on Sunday, November 16, from 9:30 a.m. until 12:30 p.m.
Like the others, this workshop includes three hours of intensive figure drawing from a live model and a simultaneous lecture on the associated anatomy, including identification of bony and muscular surface landmarks, comparison of these to anatomical images, and discussion of each feature's variations. We will have a fantastic, very defined model. The hip and leg workshop is coming up soon. Register here. Each workshop is $40, which covers the instruction, the space, and the model. Class size is limited to 12, and a supply list will be emailed to you upon registration. I would love to see you there! To register, go to the sign-up page here, or click on the image above. The Palette and Chisel is located at 1012 N. Dearborn in Chicago. It is easily accessible from either the red or brown el trains and from the CTA bus. Parking within a few blocks is also fairly easy on Sunday mornings. For more information about this workshop series, check out the original post about it. 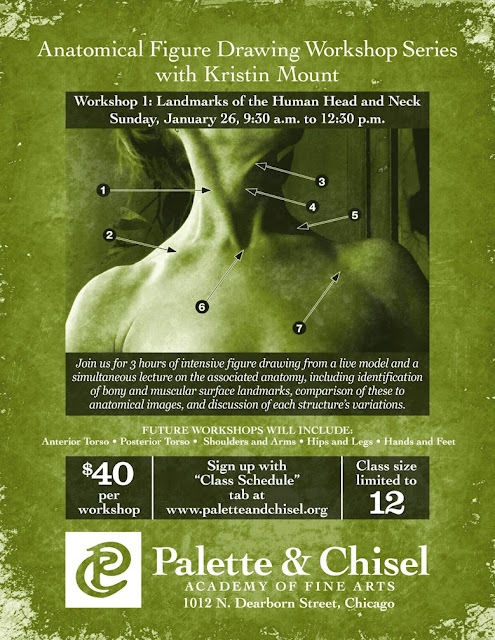 The next Anatomical Figure Drawing workshop at the Palette & Chisel Academy of Fine Arts has been scheduled! 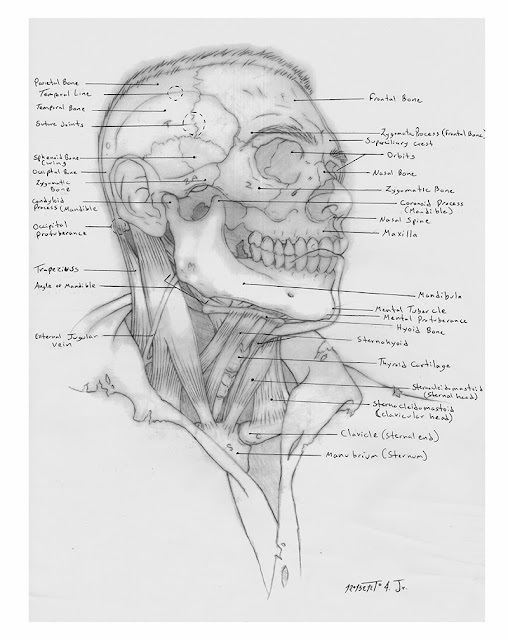 This workshop will focus on the anatomy of the posterior torso, which includes bony landmarks of the spine and scapula and the complex musculature of the back. It will be held on Sunday, March 23 from 9:30 a.m. until 12:30 p.m.
Like the others, this workshop includes three hours of intensive figure drawing from a live model and a simultaneous lecture on the associated anatomy, including identification of bony and muscular surface landmarks, comparison of these to anatomical images, and discussion of each feature's variations. We will have a fantastic model with a very defined physique. Hello all! Just a quick post to say my next Anatomical Figure Drawing workshop at the Palette & Chisel Academy of Fine Arts has been scheduled. Like the other workshops, this includes three hours of intensive figure drawing from a live model and a simultaneous lecture on the associated anatomy, including identification of bony and muscular surface landmark, comparison of these to anatomical images, and discussion of each feature's variations. This workshop will focus on anatomy of anterior torso, which includes rib cage, clavicular, and sternal features and well as muscles of the chest and abdomen. It will be held on February 23 from 9:30 a.m. until 12:30 p.m. (Again, coffee is available just a few doors down!) We will have a fantastic model with a very defined physique. 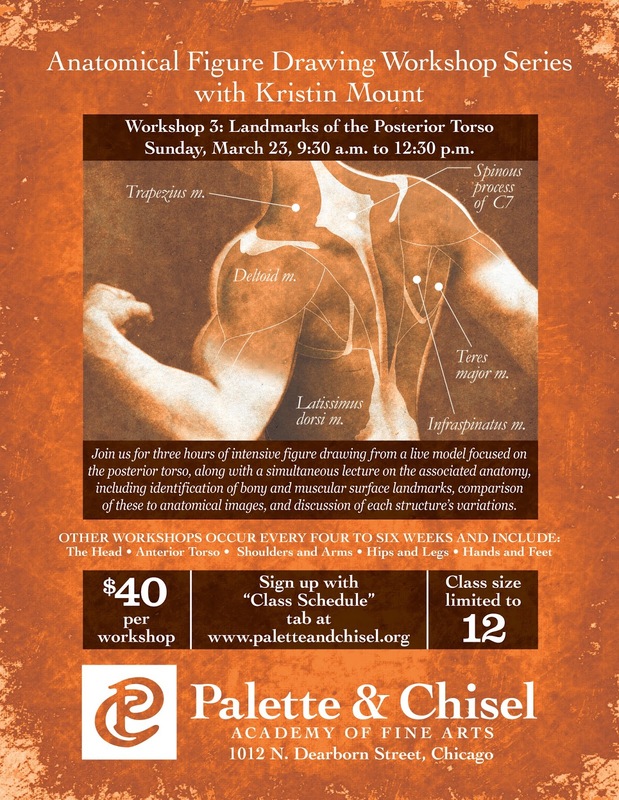 Human Anatomy for the Artist Workshop Series in Chicago! Happy 2014, everyone! I hope you all had a lovely 2013 that included plenty of friends, family, fun, and, of course, figure drawing. We Chicagoans are greeting the new year in bitter cold; we woke up to a soul-gripping (not to mention nostril-gripping) -9° this morning. I'm grateful to have a break from teaching for another few days. But as tempting as it is to stay home and huddle over the warmth of my laptop, this time of year also makes me want to gather together with friends and colleagues more often. Perhaps this is an instinct that we're more likely to survive this weather in the warmth of a group? In any case, I'm happy to say I will be hosting a series of Anatomical Figure Drawing Workshops at the Palette and Chisel Academy of Fine Arts here in lovely Chicago throughout this winter! 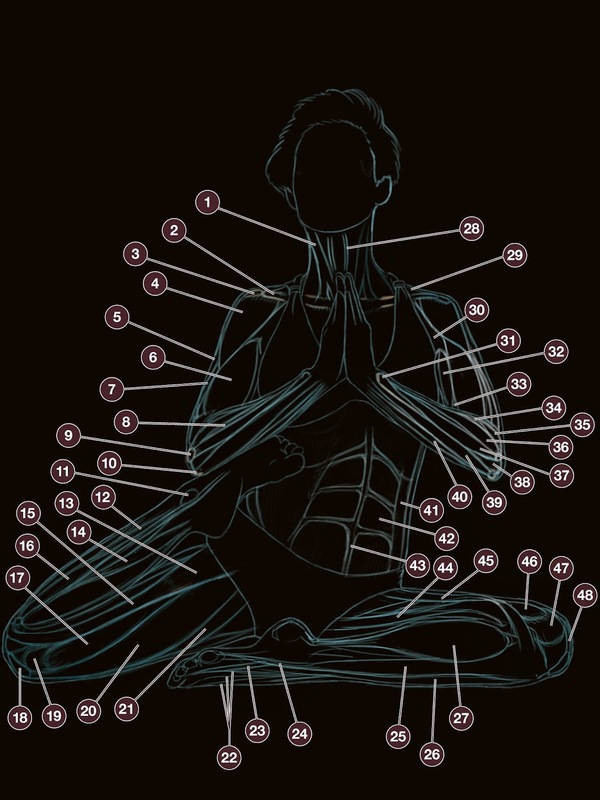 There will be six workshops total, each focusing on a different area of the body. Each workshop is $40, which covers three hours of intensive figure drawing from a live model and a simultaneous lecture on the associated anatomy, including identification of bony and muscular surface landmarks, comparison of these to anatomical images, and discussion of each structure's variations. Check out my flyer! My friend Michael Franck did this. Click on the image for easy-peasy sign up! 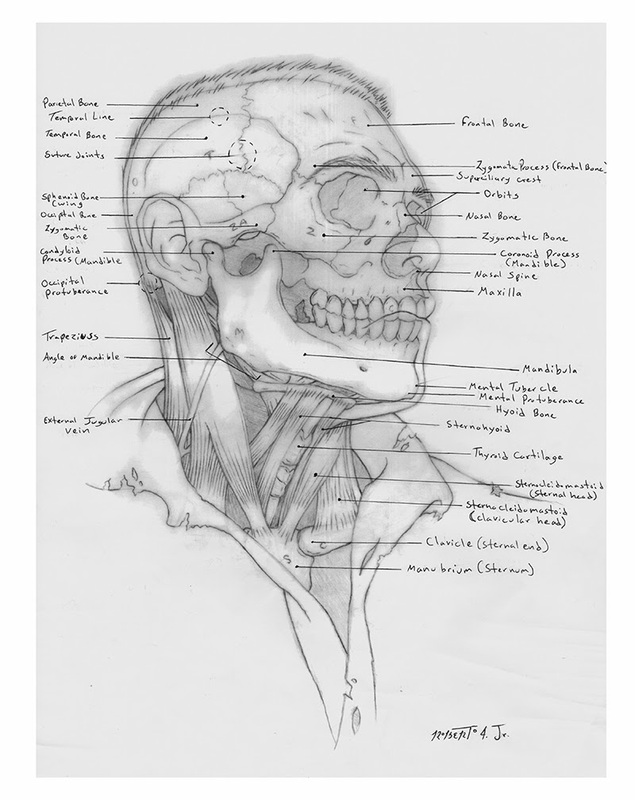 The first workshop will focus on the head and neck anatomy, and it is scheduled for January 26 from 9:30 a.m. until 12:30 p.m. (Side note: Coffee is available a few doors down!) We will have a head model with no hair so we can see every bony and muscular landmark of the head, not to mention a gland or two and a few superficial veins. Now that, to me, is just as nice as a mug of hot chocolate and a warm fire! Later workshops will include Anterior Torso (the chest and abdomen), Posterior Torso (the back), Shoulders and Arms, Hips and Legs, and Hands and Feet. They will fall approximately one month apart and their dates will be announced as they are scheduled. The Palette and Chisel is located at 1012 N. Dearborn in Chicago's lovely Gold Coast neighborhood. It is easily accessible from either the red or brown el trains and from the CTA bus. Parking within a few blocks is also fairly easy on Sunday mornings. And, as mentioned above, there is a little store a few doors down where you can get a fresh cup of coffee before class! Class size is limited to 12, so sign up early! Go the Palette & Chisel's "Class Schedule" tab to sign up, or just use this link. A supply list will be emailed to you upon sign up (it's not much-- just note-taking and gesture drawing materials and other rendering materials of your choice for longer poses.) I hope very much to see some of you there. I would love to meet some local fans of Human Anatomy for the Artist! and labeled. The extensor group is shown in blue, and a small portion of the flexor group is shown in green. 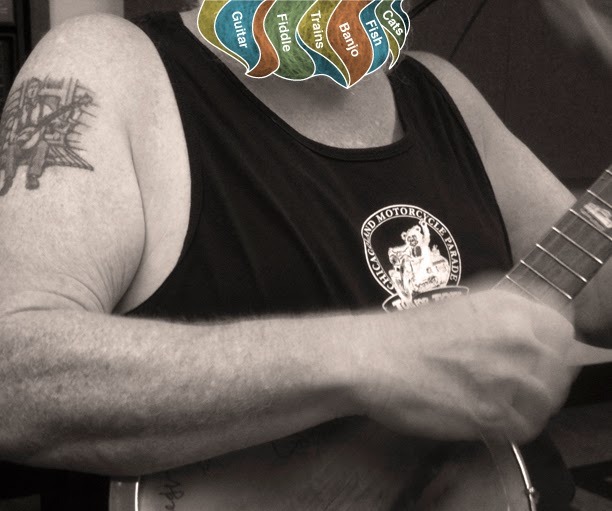 This arm, readers, is that of one of my beloved music teachers, Steve Rosen, as he plays his banjo during the Old Time Ensemble at the Old Town School of Folk Music here in Chicago. As he played on this balmy summer evening, his forearm extensors danced. How could I help but dig out my phone to catch a quick photo? Don't you love that feeling of complete absorption in an activity? Being so consumed, so lost in your work, that hours pass unnoticed? I often feel this way about this blog. And about playing music. If you don't know this feeling, I highly recommend you find a way to experience it. Love of your subject, intense concentration, and a sense of productivity is a combination difficult to match. I think the reason anatomy blogging, art, and music all fall into category for me is that all three of them combine a puzzle-like quality with a wide degree of latitude for creative expression. Learning an instrument is an especially difficult puzzle, but it can still be solved in a number of ways. There is no single correct solution. There's room to experiment, embellish, and make any tune your own. It's no wonder it's so easy to become entranced in the process. I'd have never learned any instruments in the first place if it wasn't for the talented and diverse faculty at the Old Town School. Of all the wonderful instructors in this fine institution, I've taken the most courses from Steve (above) and Paul Tyler, including fiddle, guitar, banjo, and a group course called the Old Time Ensemble. This is a shot from last summer's class, at the end of which Paul and Steve celebrated with a little cherry cheesecake! 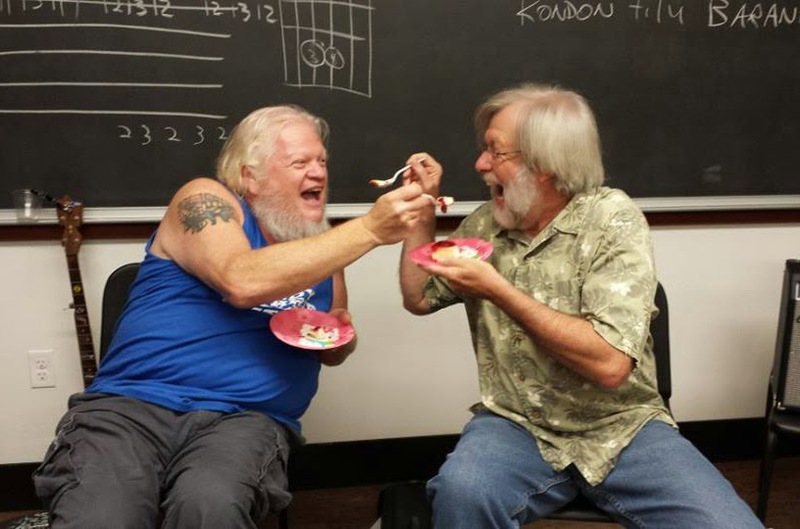 The Wednesday evening section of this class has been team taught by these two for years, Entertaining and informative, it's a popular class that is taken repeatedly (sometimes for years) by many of Paul and Steve's devoted students and fans. Each of these gentlemen has an extensive background in Old Time string music, including time together in the Volo Bogtrotters, a... well... modern day Old Time string band. Watch them play a wonderful tune, Lost Indian, here. I promised I'll get off forearms next time! Again, to learn more about Steve, go here. Better yet, treat yourself to a little of his banjo playing here. I was sorting through student work from last Spring and I happened upon several anatomical pencil drawings by a former student, Roberto Almanza. They needed to be shared, so tonight's quick post is just for this purpose. The first piece shows the posterior torso. Notice the protruding spinous process of the C7 vertebra jutting out in the center of the trapezius muscle's tendinous floor. Also notice how Roberto renders the trapezius muscle's undulations as it wraps over the infraspinatous muscles on either side. 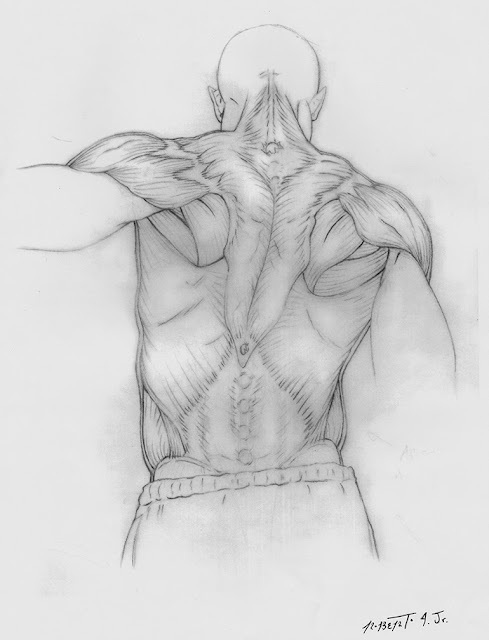 I also like that he rendered the deltoid muscle's separate sections, and (this is my favorite part) he has included the posterior portion of the serratus anterior muscle as it shows through the latissimus dorsi muscles. Most artists forget this. We can also see teres minor, teres major, the lumbar sheath (and the bulge of the sacrospinalis muscle deep to it) and a small portion of the external oblique muscles. To read more about the posterior torso muscles, go to The Posterior Torso Muscles: Let's Go Back in Time and The Posterior Back Muscles, Part 2: Under the Radar. Next we have the anterior torso muscles. I like the way Roberto has shown the cut away and peeled back rectus sheath, allowing the rectus abdominis muscle, just deep to it, show clearly. Also seen here are the sternocleidomastoid muscles, the pectoralis major muscles, the serratus anterior muscles, the external obliques, and the right iliac crest. Read more about this part of the body at The Anterior Torso: Peel Away the Layers. I only required the students to label one of these drawings, and Roberto chose to label this one of the head and anterior neck. This one is mostly bone oriented, but we also see several anterior neck muscles, including sternocleidomastoid, sternohyoid and omohyoid. We also can see the thyroid and cricoid cartilages at the proximal end of the trachea, peeking out just between the sternohyoid muscles. Read more about the anterior neck in Anterior Neck: Theme and Variations and more about the head at The Head: Part 1 of Oh My Gosh, Who Knows? Next we have the muscles of the dorsal forearm. And here's a close-up, in which we can more clearly see the muscles brachioradialis, extensor carpi radialis longus, extensor carpi radialis brevis, extensor digitorum, extensor carpi ulnaris, abductor pollucis longus and extensor pollucis longus. 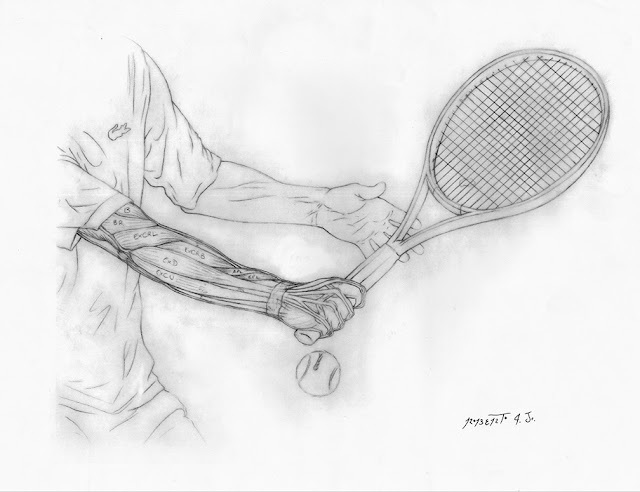 Read more about the forearms in The Dorsal Forearm, Part 1: Compartment Search, The Dorsal Forearm, Part 2: Which Side are You On, Anyway?, and The Dorsal Forearm, Part 3: The Final Chapter. Many thanks to Roberto Almanza for these images. Please do yourself a favor and check out Roberto's illustration work here. I think I will get caught up on the elbow joint next. Until next time! Get Your Own Personalized Diagram! Let Human Anatomy for the Artist Diagram YOUR Anatomy. This blog is an unfunded labor of love, and I'm eternally grateful for donations. I have been a freelance medical illustrator since 1993, and I also teach anatomy and digital illustration at a private art college in Chicago. I attended the Biomedical Visualization graduate program at UIC where I dissected cadavers, attended surgeries, stared into microscopes, and spent many late nights doing 2D and 3D renderings and animations of anatomy, cell structure, pathologies, and surgical procedures. I'm still illustrating, but have recently fallen in love with teaching, in particular helping artists understand the structure of the human figure. I'm glad you are here!